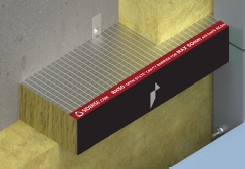 Lamatherm provides a simple, effective fire break barrier to stop the spread of fire between floors. Manufactured by Siderise, Lamatherm fire barriers provide a simple, yet effective, fire break barrier between floors, which sits behind the rainscreen cladding and stops the spread of fire in the airflow cavity. Lamatherm fire barriers allow for continuous ventilation and drainage behind the cladding while providing a hot smoke and fire seal when triggered. Lamatherm products are composed of a non-combustible rock mineral wool lamella core material, reinforced on two faces with a class O rated aluminium foil. This construction offers an excellent resistance to the passage of both smoke and fire. Lamatherm has been tested and approved by Warrington Fire Research Centre (WFRC) and each barrier provides up to 60 minutes fire integrity and insulation. Lamatherm fire cavity barriers are economical and easy to install. Lamatherm is supplied in 1200mm long strips and can be pre-cut in width to suit advised void size. 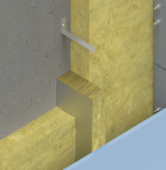 Specifically designed to meet modern requirements for drained and ventilated facades, Lamatherm RH ‘Open State’ horizontal cavity barriers have an integral intumescent edge strip which fully seals the designed ventilation gap formed at the time of installation between the barrier and the rear of the cladding. The design of Lamatherm horizontal cavity barriers ensures that the system will continue to drain any moisture within the cavity whilst maintaining airflow; and in the event of fire, provide an effective hot smoke and fire seal. There are two ‘Open State’ (open void) horizontal solutions available: RH25(G/S) for air gaps up to 25mm and RH50(G/S) for air gaps up to 50mm. 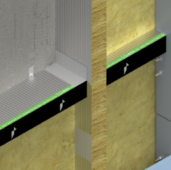 Designed to fully seal the void between an external envelope and the internal structure in the event of a fire; Lamatherm vertical cavity barriers, maintain air-pressurisation compartmentation. The unique stonewool lamella core construction enables the vertical barriers to accommodate the natural movement associated with rainscreen facades. For more information on Siderise products, contact us now.